The partnership you need to make an impact. An ECC partnership can take many forms. It may be a rapid-fire engagement in a one-on-one setting. Or it could be an interactive team process. Oftentimes, it’s a single person or small project team working with you for months at a stretch. But whatever the offering or method, our commitment remains the same: we build trust, make connections, and generate results. ECC brings you the right resource at the right time - throughout the lifespan of our relationship. Let our team of experts build the engagement that fits your goals. Coaching is about investing in an individual. We ensure that you capitalize on your potential in leadership roles, building increased influence and followership. You have the ability to inspire. And we can help you get there. A cohesive team can be the difference-maker for collective success. We engage in skill-building workshops and alignment exercises designed to renew your team’s drive and help everyone rally around your company’s mission. With greater efficiency and focus, your organization can run at peak levels. We use customized techniques to assess your current state, allowing us to design processes that improve communication, strengthen your internal structure, and set direction. 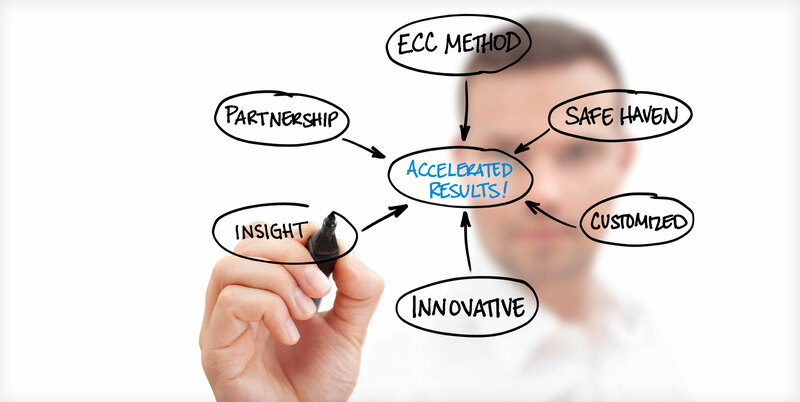 Add measurable value to accelerate business impacts. Through ECC Executive Partners, Leaders to Leaders, you gain access to an invaluable relationship with a world-class, successful C-Suite executive who serves as your mentor and confidant. We work with you from the start to ensure a match that best fits your personality, leadership and learning style, and the business challenges you face. of clients feel that our work has been a positive impact in their organization. of clients would consider working with us over other firms. of clients say our services met or exceeded their expectations.